AMMAN, Jordan (CNN) -- Two TV cameramen were killed Tuesday when U.S. tank fire struck the Palestine Hotel in Baghdad, Iraq, journalists said. An Al-Jazeera reporter also died Tuesday when a U.S. airstrike and tank artillery hit the network's Baghdad headquarters, the Qatar-based network said. In both cases, U.S. Central Command said U.S. forces came under fire. 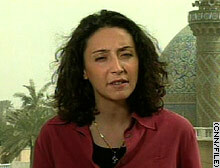 CNN Correspondent Rym Brahimi had stayed in the hotel -- a base for much of the foreign media -- before the Iraqi government expelled her from the country. She talked Tuesday to CNN Anchor Carol Costello after contacting a hotel guest on the phone. Below is an excerpt of that on-air conversation. BRAHIMI: Carol, this is a very sad day for us in the journalistic community. Two journalists have been killed. I was talking, indeed, to somebody who was just at the Palestine Hotel literally minutes before this ... hit the 15th floor of the building, where the Reuters journalists had an office. One of the journalists [from Reuters who] was hit was killed. I understand three or four of his colleagues at least have been injured, and we're hoping to hear more news on their status a little later. I understand from the person I spoke to that had just left the building that it seemed to be coming from a tank, possibly one of the two ... U.S. tanks advancing on the nearby al-Jumhuriya Bridge. There's been an exchange of fire between those tanks and some buildings across the river from there. It's possible that one of these tanks may have been the one to hit the Palestine Hotel. Another journalist was killed earlier [Tuesday], Carol, as you know, a journalist from Al-Jazeera, when the building that houses Al-Jazeera, the Arabic television network, was hit. The office seemed to have been bombed. The journalist in question, Tareq Ayoub, is somebody who also worked for CNN at one point, a very dear colleague. He leaves behind a 6-month-old baby and a wife. He was taken away immediately as part of the two injured journalists from Al-Jazeera but seemed to have died pretty soon after the house that hosts Al-Jazeera was hit. Al-Jazeera, as you know, is on the banks of the Tigris River, not far from the other TV, Abu Dhabi, the other Arabic satellite television that was also hit and was taken off air briefly at one point. It's a very, very sad moment, Carol, for all of us. Tareq Ayoub was someone who was very hard-working, an extremely helpful colleague, and we have all had very close ties to Al-Jazeera, to our colleagues there. We've worked very closely on the field with them. They've always been extremely helpful, and it's a very difficult situation. As you know, in these times of war, solidarity takes over competition. BRAHIMI: And it's a very, very hard moment for everybody. COSTELLO: Definitely so. Let's go back to the Palestine Hotel because government sources say the media certainly is not being targeted. But we do understand that someone saw snipers on the roof and maybe that's why this explosion occurred. BRAHIMI: I can't comment on that. I don't know, I can't say whether or not that is accurate. I know that the Palestine Hotel, from the beginning of the war, was the hotel where all the journalists were staying. There were very few journalists -- in fact, I don't know of any journalists who at the eve of the war, when the war began, were still anywhere else but at the Palestine Hotel. In fact, the Ministry of Information had been hit a couple of times, and this is where we used to work out of before the war. In the first few days of the war, some journalists were still going back there to attend press briefings. But when that was, that building was hit, then the press center from the Ministry of Information moved into the Palestine Hotel. So that was clearly -- it's a big tower. It's quite visible, Carol, and it was a place that was known for all journalists to be there and to work out of the Palestine Hotel, especially as they were restricted in their movements and it would be very difficult for journalists to go anywhere else than that building. COSTELLO: Right. And we see activity on the roof there. Satellite dishes are located up there, and possibly photographers go up there and shoot some pictures. Tell us about that because, you know, there's some confusion over what forces on the ground were seeing on the roof of that hotel right now. BRAHIMI: Well, yes, one would have to really wonder. This hotel had been, as I say, the place where journalists were going to be covering the war from basically. It took awhile for journalists to get permission from the Ministry of Information to be able to bring all of their equipment and the gear that comes with live TV coverage to the hotel from the Ministry of Information. But eventually that permission was given, and a lot of satellite dishes were set up on various areas on the roof of that building. So definitely, I'm not sure what anyone could have seen from a distance. But, again, I would imagine that this was a place that -- it's a tall, it's a very high building, and it kind of sticks out in the center of Baghdad.